There have been many predictions of markets and economies crashing this year but in the Daily Mail today is a report from 3 well-known forecasters and authors Gerald Celente, Harry Dent and Robert Prechter that this year you had better prepare for an economic 9/11. Just when you thought unemployment was dropping and stock markets were surging back, these three analysts today sent out a stark warning to Americans to brace for another financial crash. Trend forecaster Gerald Celente advises buying a gun to protect your family, stocking up on gold if the dollar crashes and planning a getaway, so it’s no shock he’s preparing for an ‘economic 9/11’. Share prices and unemployment are posting their best figures in four years since the recession hit, but Mr Celente, along with authors Harry Dent and Robert Prechter, says the rebound won’t last. All three were profiled in a USA Today feature on Monday. Mr Dent, who had The Great Crash Ahead published last September, believes stocks are simply experiencing an artificial short-term boost. 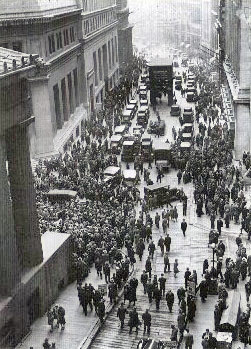 Mr Prechter, who had a new version of Conquer the Crash published in 2009, is fearful of today’s economic similarities to the Great Depression and says the brief recovery will fail like in the 1930s. ‘The economic recovery has been weak, so the next downturn should generate bad news in a big way,’ he told USA Today, saying the markets look ‘very bearish’ for the third time in 12 years. Mr Celente, who works as an analyst at the Trends Research Institute, which he founded in Kingston, New York, has been doom-mongering for years – so his latest concerns are hardly surprising. But he told USA Today that a potential run on banks by savers could cause the government to invoke a national holiday and temporarily close them all, which happened during the Great Depression. It comes as billionaire Berkshire Hathaway chairman and CEO Warren Buffett today painted a happier picture of stocks, which he said are relatively cheap compared to other investments as the economy improves. Meanwhile contracts to buy previously owned U.S. homes neared a two-year high in January in further evidence the housing market was slowly turning the corner, an industry group said today. However oil prices have been spurred higher by worries over disruptions to Middle East supplies due to sanctions against Iran and expectations for greater demand from an improving U.S. economy. But on the markets, the S&P 500 has risen nearly nine per cent so far this year and the Dow Jones is trading around the psychologically-important mark of 13,000. But the three experts aren’t happy. Mr Prechter told USA Today both markets will crash back below their lows hit at the height of the financial crisis in March 2009. Unemployment fell last month to 8.3 per cent, a three-year low, and weekly jobless claims are at a four-year-low. But Mr Dent believes that people will be left out of work again in 2013 or 2014 and U.S. markets will crash because central banks have been pumping so much money into markets that they are unrealistically strong. ECB set interest rates for core of Europe but too low for Spain. Cheap money created a real estate bubble and brought in many unqualified immigrants. When crisis happened, the real estate bubble collapsed causing the economy to collapse. The cuts now won’t make a difference, it’s the euro that’s causing the problem. There is about 6 – 9 months of goodwill left in the country after that the people will feel deceived when they realize that reality doesn’t meet their expectations. Spain’s future does not lie in the euro zone, same for the PIGs. Spain’s exit from eurozone is a political problem. Of Spain’s’ foreign debt of €900 billion, about half is owned by France and Germany so they don’t want Spain to leave the euro. Because if you leave the eurozone you must default. It’s very simple, if I am a bank and you owe me money, then “STOP EATING, TAKE YOUR CHILDREN OUT OF SCHOOL AND PAY ME BACK”. Devaluing is the solution and long as you make other structural changes also, but you can do nothing if you don’t devalue. Politicians have FALSELY said if you leave the euro you are out of the EU. 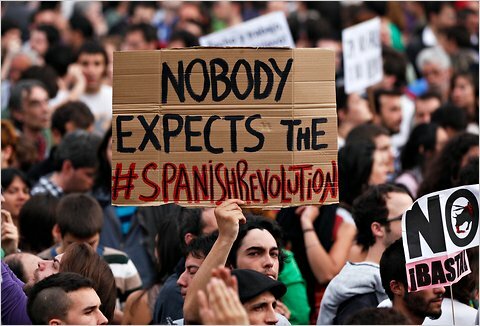 In Spain nobody is aware that the crisis is caused by the euro and lack of competitiveness it brought. 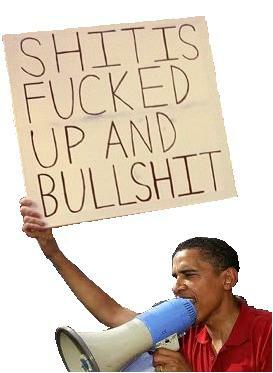 The banks and media blame overspending by the administration, although that didn’t help. Its economics 101, if you have these countries in trouble and force cuts, this will cause them to go deeper into recession. You will never reach the goal of closing public deficit because the cuts keep reducing your income. Conditions in Spain have deteriorated at a rapid pace. As little as a few months ago the Spanish economy was foolishly projected to grow at .7%. Now it expected to contract 1%. Likewise, Spain’s budget deficit was supposed to shrink to 6% in 2011 and 4.4% in 2012. Instead it rose to 8.51 percent in 2011, up from a revised estimate of 8.2% which was up from a revised estimate of 6.5%. Spain must explain soon to the European Commission why its 2011 budget deficit was substantially higher than expected and deliver clear future budget plans, the Commission said on Tuesday. Spain’s 2011 budget deficit came to 8.51 percent of GDP, the finance minister said on Monday, up from early estimates of 8.2 percent and far above forecasts from the Commission for something nearer 6.5 percent. Specifically, Spain’s budget deficit is 91.3 billion euros, 8.51% of GDP. So it should not take a wizard to realize the simple mathematical fact that team Rajoy has not yet begun with budget cuts and tax increases, if by 2012 Spain is to meet the 4.4% of GDP deficit target set by creditors. The measures announced in December were only an appetizer. Instead of sharpening the blades, I think a good lawn mower would be more practical. The announced cuts and tax increases of last December (income tax, capital gains), are expected to generate about 14,900 million. To meet the objective of a 4.4% deficit, in 2012 the government deficit should not exceed 46,500 million euros. To do so requires a nearly 30 billion euros hole to be filled, with the aggravating circumstance that it’s now March and those 30 billion euros need to come in the next 9 months. This figure is double the cuts and tax increases approved last December. So Rajoy has quite imagination if he expects this to happen. The sanctions include a phased ban on importing oil from Iran, which EU member states are to implement by July. China and India, two of the largest consumers of Iranian oil, have said they will continue imports, but Japan and Korea have announced cuts to quotas following pressure from the United States. As a result the value of Iran’s rial has plummeted, pushing the price of goods sharply higher across the country. Iran imports commodities from China and India in exchange for the countries’ currencies. Tehran’s move is aimed at bypassing the upcoming freeze on CBI’s assets and the oil embargo, which the European Union’s foreign ministers agreed to impose on the Islamic Republic. A basic requirement in life is water. It looks in future years this is going to be a lot more expensive. A story is coming out of the US regarding the cost of water tripling. As if gas prices rising isn’t enough. The time to upgrade the water system was 6-7 years ago. The timing is just lousey. A shocking new report about the nation’s crumbling drinking water system says that Americans should expect their bills to double or triple to cover repairs just to keep their faucets pouring. That means adding up to $900 a year more for water, nearly equal the amount of the newly extended payroll tax cut. Fixing and expanding underground drinking water systems will cost over $1 trillion in the next 25 years and users will get socked with the bill, according to the American Water Works Association. Families can expect to pay at least $300-$550 more for water in taxes and fees just to keep their current systems operating. Add growth and improved systems, and that bill jumps to $900 for a family of three, said the report. Currently, Americans pay about $400 a month in water taxes and fees. If it’s not passed, the sky will fall in, the world will end, everyone in europe will hate you. If you do pass it, everybody will get a job and the Celtic Tiger will come back. or some thing like that. As a whole, to comply with the Pact parameters, the Euro area economy will have to shrink by some €535-540 billion every year between now and 2020 – an equivalent of reducing euro area growth by a massive 3.9% annually. Ireland will be one of the worst impacted economies in the group courtesy of our excessively high structural deficits, debt to GDP ratio and cyclical deficits. In 2012, Ireland is forecast to post a structural deficit in excess of 5.5% of potential GDP – the highest structural deficit in the entire Euro area. To cut our structural deficit to 0.5% will require reducing annual aggregate demand in the economy by some €7-8 billion in today’s terms. Debt reductions over the period envisioned within the pact will take an additional €12 billion annually. For an economy with huge private sector debt overhang, paying some 12% of its GDP annually to adhere to the Fiscal Pact is a hefty bill on top of the already massive interest bill on public debt. My own research based on the Euro area data shows that during 1990-2008, only two euro countries – Finland and Malta – have complied with the Fiscal pact criteria more than 50% of the time. The rest of the member states, including Germany and France, have run sustained deficits more than 60% of the time. Once a euro state found itself stuck in twin current and fiscal deficits in one decade (the 1990s), transitioning to a twin current account and fiscal surplus in the next decade (the 2000s) was virtually impossible. For example of all states in EA17 who were in current account deficit throughout the 1990s, only 2 have managed to achieve current account surpluses during the following decade. Only one country that experienced fiscal deficits in the 1990s has managed to generate fiscal surpluses over the following decade. No country has been successful in restoring fiscal and external balances after a decade of twin deficits. In short, the Pact our Government so eagerly subscribed to is at the very best a continuation of the status quo. At its worst, Ireland and other member states of the Euro are now participants to a fiscal suicide pact, having previously signed up to a monetary straightjacket as well. Mr Ross said it was a fiscal pact on austerity and was dictated by the French and Germans without any input from Ireland. He also said it was a road we should not go down and the debt reduction has to be tied into the ratification process. Excellent news for Silver when a paper contract attack on silver price failed. The cartel dumped 102.5 million ounces in paper silver over 7 minutes in an attempt to manipulate the silver price down but failed. Silver has put in a monster rally this week, and much to the cartel’s dismay, was preparing to close the week above $35.50 today, preparing a break-out next week that could potentially fill the gap from the September smash to $40, and see silver off to the races back to challenge the all-time nominal highs near $50. Obviously, the cartel stepped in with a massive paper raid to prevent such a bullish weekly close. That’s where things got interesting and likely induced more than a few Myocardial Infarctions today among JPMorgan execs. Check out the following price and volume chart screen shot on this 1-minute silver chart courtesy NetDania. Notice the massive volume that began at approximately 14:47, with 4,000 paper contracts dumped on the market in a single minute, followed by 2,500, 1,800, 3,200, 3,000, 2,900, and 3,100 over the next 6 minutes. 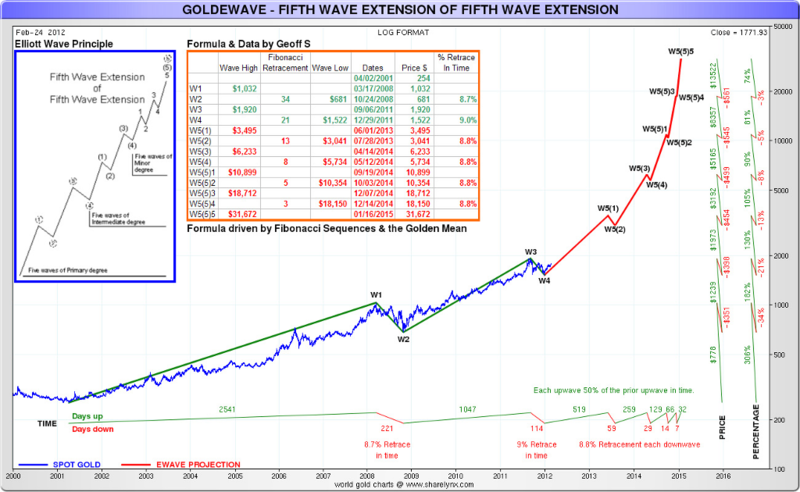 Elliot wave prediction for Gold from Jesse’s Cafe Americain.